From the US Gran Prix of Cyclocross and the Cyclocross World Championships to ABUS bike locks to Vice President of Event Services at USA Cycling, Joan Hanscom has made a career out of her love for cycling and continues to pour her heart, soul, and energy into the sport. In an industry that is turbulent, always evolving and subject to whims, for the past 15 years, Hanscom has been a constant force, committed to making racing sustainable one series at a time. And today she’s well respected as a race promoter, a longtime cyclist, and a leader. Hanscom’s first job in professional cycling was that of event director for the Wachovia Cycling Series (the famous Philly Week in its heyday). She remembers standing on the stage directly above the racers, listening to the final race instructions, hearing the music, the voices of the announcers, the National Anthem, the revving of cars and motos, the colors of jerseys, the sound of cleats clipping into pedals and the wind caused by a peloton of riders surging off the line. “At that moment I felt like I was part of something magical. All the months of hard work to get the riders to the line – I knew at that moment that this is where I was supposed to be,” Hanscom said. Hanscom and her business partner, Bruce Fina, had a vision for growing cyclocross in the United States that would prepare the best American racers to compete against the best in the world. To do this, they wanted to create a nation-wide series that would see the nation’s best racer go head-to-head consistently, weekend after weekend. The US Gran Prix (USGP) of Cyclocross was born, and between 2004 and the 2012-13 season, the series was consistently visited Madison, Louisville, Fort Collins, Bend, Portland and Mercer County. The series came to an end in 2013 with the UCI Cyclocross World Championships in Louisville, KY.
As the co-owner and jack-of-all-trades of the series, Hanscom worked tirelessly but always with a wide brimming smile and an infectious laugh. Taking photos, directing, selling sponsorships, planning logistics, hiring contractors, pounding a lot of stakes into the ground, zip-tying signage, running the media and public relations and presenting race day podiums –Hanscom had her hands in everything. “I was doing the thing I love best. And I was with the people that truly feel like family or a tribe to me more than anywhere else. For me there is nothing better, nothing more exciting than the moments right before the race begins. It’s always been that way for me,” said Hanscom. And to this day you will find riders reminiscing about the USGP with conversations mounting upon the need of the revival of the series. But in 2012, the USGP found themselves in a very desperate spot. Their title sponsor from the previous season had failed to meet their financial commitments. “It was devastating. It was the season before the World Championships in Louisville and we desperately needed the season to happen for our riders,” said Hancom. And so in August of 2012, Hanscom and Fina had no other option but to reach out to each existing sponsor informing them of the need to cancel the series. What happened next, Hanscom described as a bike-racing miracle. “One by one – they all rallied to our side. They kept us alive. They saved the series. Brands that had done so much for us over the years and new brands – they all stepped up their support and made sure it all happened,” said Hanscom, adding that they did not do it for exposure or marketing purposes, they did it to save something special. The miracle, however, could only sustain them for that season and after the world championships, the series came to an end. Hanscom went on to work at ABUS bike locks but it wasn’t long before she found herself back at the start line, directing. 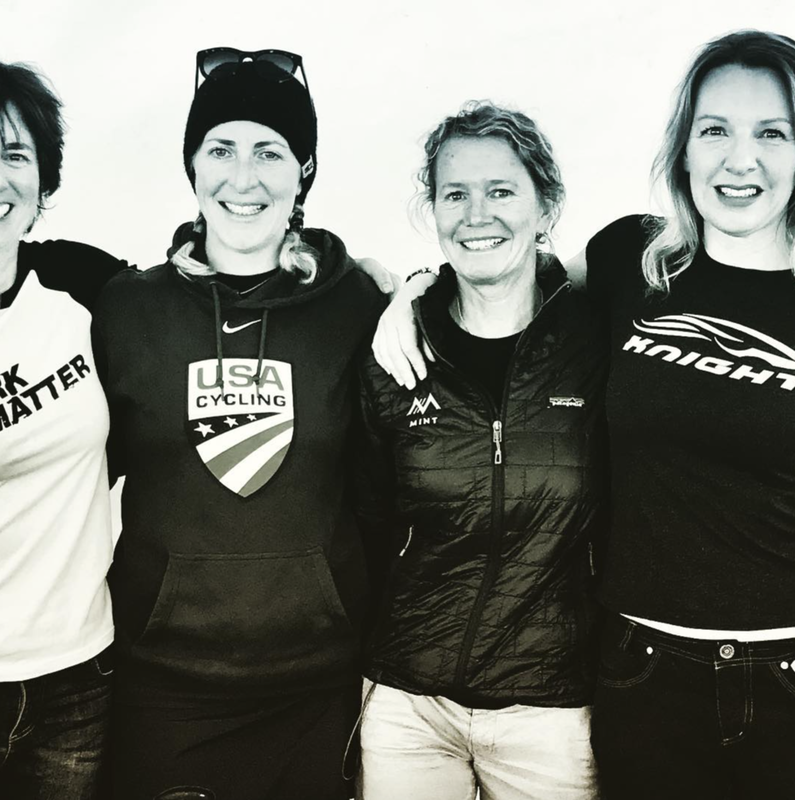 Currently the Vice President of Event Services at USA Cycling, Hanscom today is director the directors if you will as she leads her department’s mission to work with grassroots race directors across the country and providing them with the best possible products and customer service to create world-class events. You’ve had an amazing journey. What have you held true through it all? Best advice you have been given thus far. If you could go back and tell your younger self anything what would you say? What in your opinion are the fundamentals that make a great race and or series? “Attention to details. Attention to all customers not just the pros – but the people who help pay the bills too – the volunteers, fans, sponsors and media. To make a great race you have to have fun safe courses, clean porta-potties, and people who amplify the stoke. You need to make something that people will be excited to talk about on Monday morning. What is a race you have always wanted to do? What are your beliefs that you lead by? If you could go on a ride with any group of female riders who would it be? What are your hopes for the future of the cycling industry? “That we keep building awesome communities for people to play on bikes, race bikes, ride bikes and do it in a supportive way for EVERYBODY. Racers supporting races, racers supporting racers. Safe roads and open spaces. A broader community that respects bikes. An industry that encourages participation not elitism. Mostly I want USA Cycling, riders, racer, the media, the industry, little kids, mums and dads all to feel the stoke of riding their bikes.